Stumps (both those on the ground and stumps of removed branches) are sometimes able to regenerate into new trees. Often, a deciduous tree that has been cut will re-sprout in multiple places around the edge of the stump or from the roots. Depending on whether the tree is being removed permanently or whether the forest is expected to recover, this can be either desirable or undesirable. Stump sprouts can grow very quickly and sometimes become viable trees themselves either for aesthetics or timber, due to the existing root structure; however, the cut portion of the trunk may weaken the sprouts and introduce disease into the newly forming tree. Let H and H Tree Service provide all your stump removal needs. 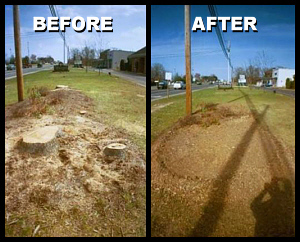 Our professionals will remove your stump in no time and leave the spot looking like there had never been a tree.